During my early days of real food, I was eager to make “all the recipes” and regularly found myself buying specialty ingredients. This way of cooking, and eating, was expensive. I spent a lot at the grocery store on food that didn’t carry us through multiple meals. Over the years, I’ve learned how to shop and cook smarter by meal planning and rotating favorite meals. I’ve also learned how to stock a capsule pantry in order to simplify meals, save money, and stretch ingredients across multiple meals. I’ve shared my meal planning strategy in the past. And I’m going to share more about rotating favorite meals in a few weeks. Today, let’s talk about a capsule pantry. I learned about the concept of a capsule pantry a few months ago from a friend. After she shared about this new concept, I realized that I’ve had a capsule pantry for quite some time. I just didn’t know there was a special name for this intentional method. A capsule pantry is much like a capsule wardrobe; a term that you are probably familiar with. The capsule concept was created by Susie Faux, a London Boutique owner in the ’70s. According to Faux, a capsule wardrobe is a collection of a few essential items that work together and don’t go out of style (timeless). A capsule pantry is an intentional way to simplify. A capsule pantry is made up of essential foods (ingredients). Foods that you love and use. Foods that can be used to create multiple meals. 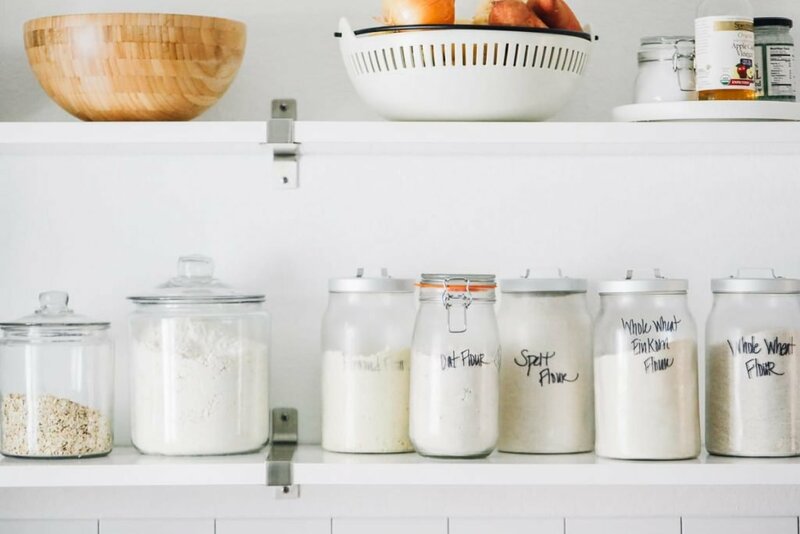 While most of us think of a pantry as just dry goods, this concept applies across the board to the fridge, freezer, and actual pantry (dry goods). In a day when food products are constantly marketed to us (by online influencers, commercials, etc. ), a capsule pantry keeps one focused on the essential, the important, the foods/ingredients that actually have a purpose. A capsule pantry simplifies not only your pantry space (goodbye ingredients that sit for years, just taking up space and not serving a purpose), but also simplifies planning and preparing meals. 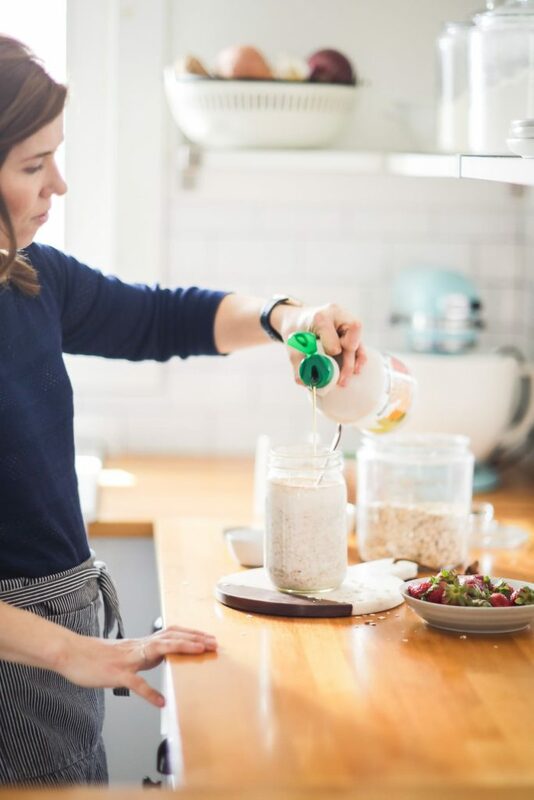 When you have a pantry that’s stocked with ingredients and foods you love and use, creating simple, nourishing meals is easy. A capsule pantry, to me, is essential for creating a simplified, ready-at-any-moment real food lifestyle. How do you create a capsule pantry? Think about the meals you regularly make. (Remember the collection of meal ideas and recipes you’ve been keeping and using to create regular meal plans? Well, this list is going to prove valuable as you build a capsule pantry.) Oatmeal? Granola? Spaghetti? Soups? Tacos? Grain-style bowls? Bean burritos? Pancakes? What ingredients do you use to regularly make these meals? What foods does your family regularly enjoy as snacks? Berries? Yogurt? Granola? Start a list and keep it going. 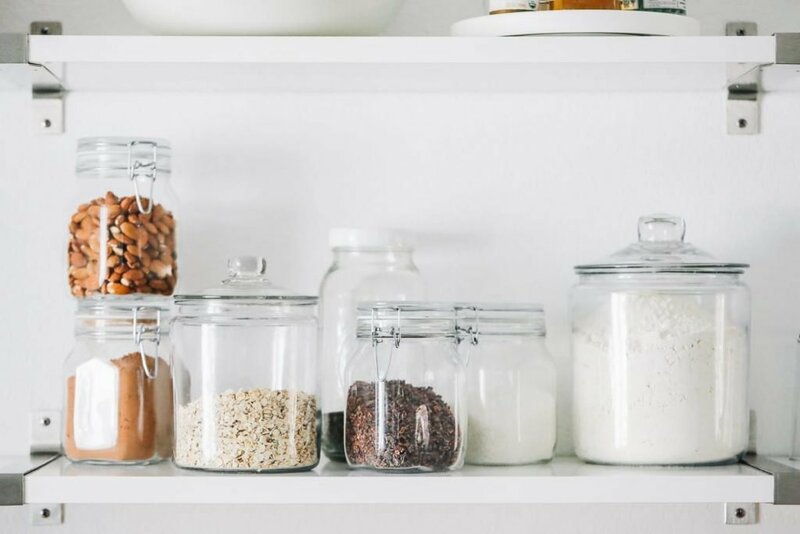 Now is also a great time to organize your pantry. I find that organizing my food spaces by category is particularly helpful. In the actual pantry, sort food into categories that make sense to you, such as: canned ingredients (tomatoes, beans, coconut milk, etc. ), baking ingredients (cacao/cocoa, sugars, etc. ), dried fruits, snack foods, seasonings. I keep my nuts and seeds, along with grains, in my garage fridge to keep them fresh and bug-free. Repeat this practice with the freezer and fridge. I shared my fridge organization in this post. The ingredients and foods stocked in your capsule pantry should be carefully curated by you, based on your family’s lifestyle. I recommend keeping a list of these ingredients/foods. Use a piece of paper or a note in your Notes App. I’ve created a printable of my capsule pantry as an example (DOWNLOAD). When you notice something is getting low, make a note on your grocery list and restock it. That way you can always make simple, nourishing meals. We have an Amazon Alexa. When an ingredient is about to run out, I announce, “Hey Alexa, add rice to my Whole Foods list.” I could also use a pen and paper, but using this convenience is a such a small win for this busy mom. How do you use a capsule pantry? 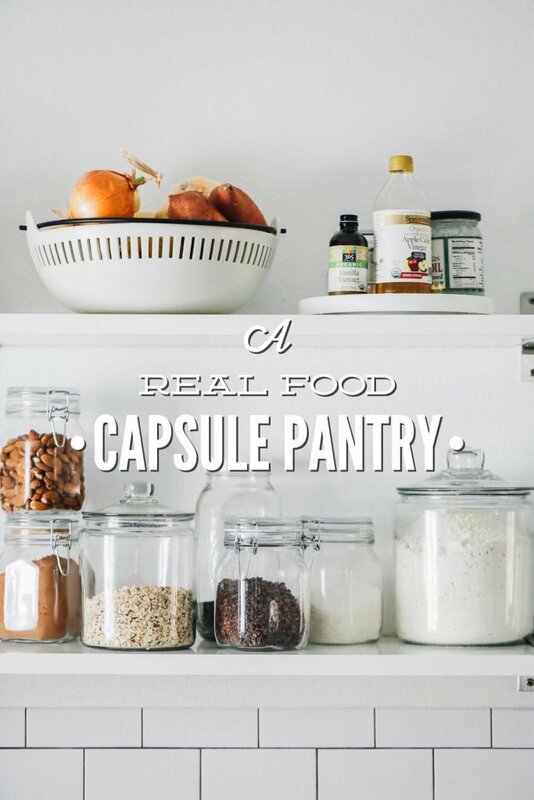 A capsule pantry is your source for creating simple, real food meals on a regular basis. 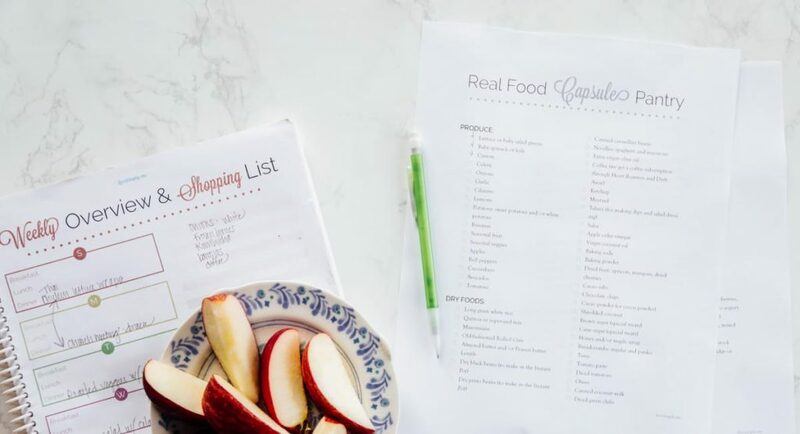 Your capsule is the place to turn, along with your favorite meals list, to easily create meal plans. Once you know what you have in stock, what needs to replenished, and any special ingredients you may need (we’ll talk about this next), build a grocery list (you may already have a few items on that list from noticing what is about to run out). Do you still make recipes that call for special ingredients not found in your capsule pantry? Yes, definitely! 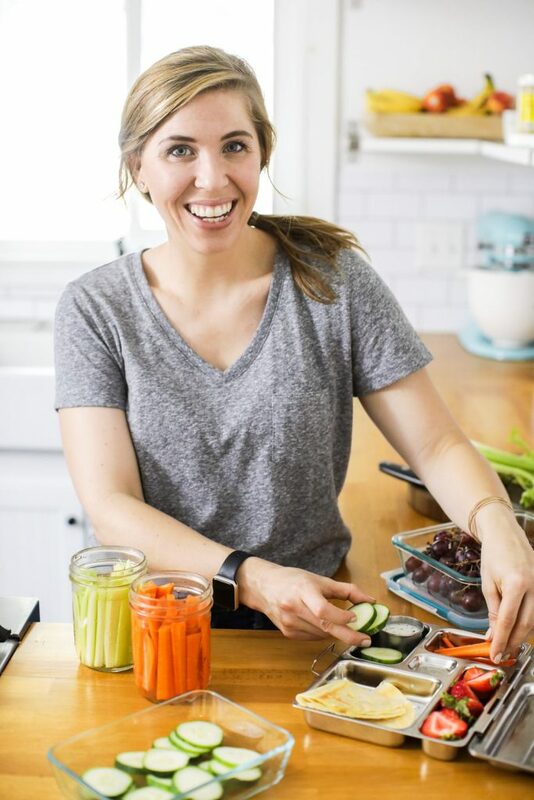 The idea isn’t to limit meals or restrict you; rather, a capsule is meant to simplify meals and approach real food from a budget-friendly standpoint. The idea is to keep a stock of multi-use ingredients/foods that are regularly used to build nourishing meals. That’s it! It’s okay to make recipes that call for something you may not regularly stock. These recipes aren’t going to make up the bulk of your meals, but it’s always fun and inspiring to experiment with a new recipe and special ingredients. Here’s my capsule pantry list (CLICK HERE TO DOWNLOAD). I share this list to provide an example of what my capsule pantry looks like. If you’re feeling a tad bit overwhelmed by the idea of a capsule pantry, let me encourage you. A capsule pantry isn’t built overnight. It’s a process, an intentional way to simplify a real food lifestyle. Building a capsule, along with building a list of favorite meals, takes time. If you’re new to real food, be patient. Experiment with simple, nourishing recipes. 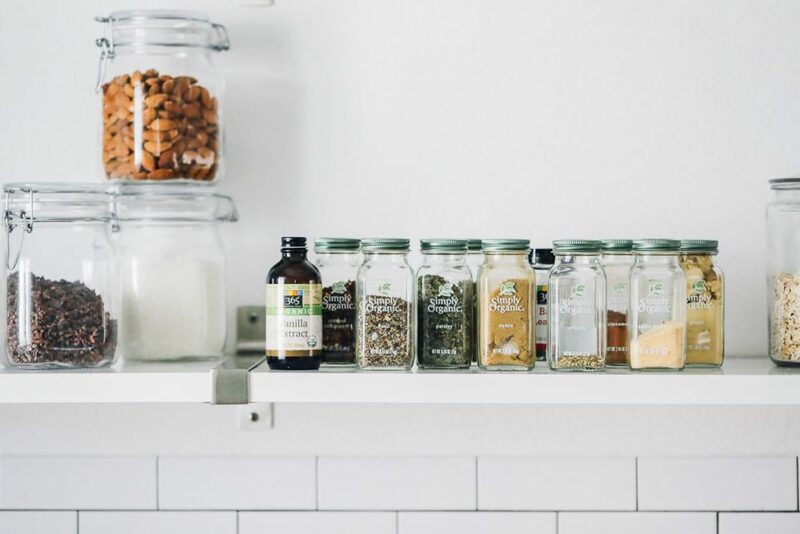 (Most of the recipes shared on Live Simply are based on my capsule pantry.) Keep a list of recipes you love making and your family enjoys eating, and the common ingredients used to make these meals. This list will help you build your capsule pantry, one ingredient at a time. A capsule pantry is what got me through the last three years of my Mom’s life. With her special dietary needs I could easily throw together meals after her weekly treatments. And shopping while she was in treatment went smooth and quick. While I know your post is mostly geared toward busy families, this type of organization is very beneficial to care givers as well. It makes life easier and less stressful. Now that I’m on my own I still keep up with the capsule pantry even though I have different food choices. Thank you and happy Wednesday, Kristin. Thank you so much for sharing, JoAnn! I love that. I sort of do this, but it’s a really good idea! I love all your different food storage! Where did you find the ones with your different flours? With the handles? Hey Christy, Thank you! The glass ones with the silver lids (with handles) are from IKEA. I bought them a few years ago, but I think they’re a regular item there not a special collection. The other jars are from Target (Anchor brand and then another brand near the mason jars). Where did you get your Jars and container from? 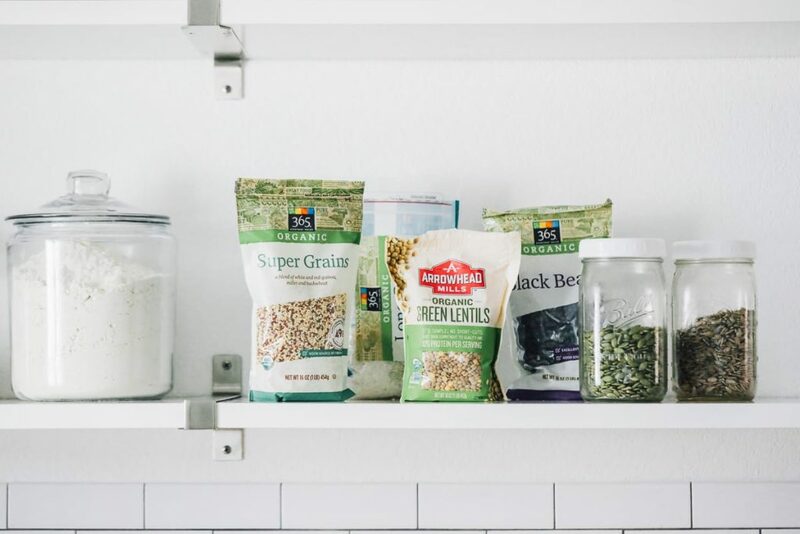 I am looking to organize now that I am dealing with healthier and more authentic foods, when I am cooking I see now that I hate dealing with boxes and packages – I looooooove your pantry look. Hey Yolanda, Thank you! My containers are from IKEA (the metal tops) and Target (the latch containers and jars). My family loves pasta. I’m currently working on current pantry items for healthier/cleaner versions or homemade. I’m not in a place to make my own pasta just yet. Do you have suggestions? I live in rural Nebraska, so stores like Whole Foods, Trader Joe, etc are hours away. I do use Amazon. Hey Brandi, I also love Vitacost–an alternative to Amazon and many times cheaper. I love Jovial brand brown rice pasta or einkorn pasta. That’s my go-to brand. I don’t make homemade pasta either ;). What are the asterisks for next to certain items on your shopping guide? Hey Melody, The asterisks are next to foods traditionally considered pantry (dry good) foods, but I keep mine in the fridge so they don’t go rancid.